Having heard SPM Reference interconnect sounded at Hi-Fi 97, I was anxious to try it in my system. I have had a number of different types of wires in the past, but never a flat cable. All of Nordosts cables are flat except their Moonglo digital cable which uses 2 very fine coax cables in each cable. Nordosts product line starts inexpensively with Octava and Flat 2 and Flat 4 wires. Flatline speaker cable and Magic interconnect are "step-up" performers. Then comes then Blue Heaven line followed by the Red Dawn the next-to-the-top line which was reviewed in SoundStage! in August by Todd Warnke. SPM Reference is currently the top-of-the-line product from Nordost. SPM Reference products are packaged in velvet lined wood boxes and carry a lifetime warranty. Nordost chose "SPM" for these cables to indicate "speed, precision and musicality." Priced at $1,100/meter/pair, the SPM Reference interconnects with RCAs have interesting spring loaded outer sleeves which completely cover the center pin of the RCA when the wire is not plugged in. When you insert the RCA, the moveable outer shield contacts the shield/ground of the female RCA before any other part of the RCA. If you accidentally plug in something while the system is "hot", you hear nothing but a gentle fsst as the connection is made. Do this with a typical RCA and you can get very nasty and startling buzzes or loud pops from your system. SPM interconnect has 16 conductors, 8 per signal polarity. All 8 of the + wires run parallel to each other with great precision in the evenness of the spacing. In the center of the cable is a narrow gap followed by the remaining 8 wires. Each conductor is 32 gauge and rectangular. The copper used is "eight nines," meaning purity of the copper is 99.99999999% The copper is silver plated. The insulation is Teflon, continuously extruded over the 16 tiny conductors. The Teflon has a lavender tint to it making the appearance that of a transparent lavender ribbon with 16 parallel silver threads through it. Quite nice looking. Terminations to the RCAs or balanced XLR connectors are finished with white (left) and lavender (right) heatshrink. The interconnects have extremely low capacitance and inductance, some of the lowest figures available in high-end interconnects. Impedance is another story. At 110 ohms, these interconnects are obviously not in "the bigger the wire the better" school of interconnect design. Nordost has attempted in the SPM series to get the signal to move at the highest possible rate of speed along the cable while delivering all audio frequencies at the same time. The impedance of these cables is intentional and likely results from Nordosts study of audio signal propagation speed. This last part just may be a key factor in higher performing audio cables and equipment. There are people who seem to know about this subject, but they are keeping quiet about it. Not having actually done any research myself, Ill call this a hypothesis, though I strongly suspect there is enough information around to support it. The more difference there is in signal propagation times at different frequencies, the more "time smeared" the signal is. In the last few years, more and more people are looking into this "time smear" effect in high-end audio components and wires. There is a suspicion that the human ear responds most strongly to the frequencies of a sound that arrive at the ear first. Therefore something that measures "flat" can sound too bright if the high frequencies arrive before the mids and bass. This thinking, if it proves true, could mean a revolution in sound quality for high-end audio equipment. It could also obsolete a lot of speakers, wires and components which do not perform well in the time domain. Im not saying this is a fact, but it sure seems like a strong possibility. Imagine after all these years being able to jam it up the nose of disbelieving high-end critics who refuse to accept that anything that measures "flat" in frequency response could have any sound other than "perfect." Sure it measures flat, but it doesnt sound flat because the highs arrive 15% faster than the mids and the lows arrive 10% later, so the sound is skewed toward seeming "bright" because your ear hears the top end first. Just a hypothesis, mind you, but a tantalizing one. Nordost has made measurements of audio signal propagation in SPM wires and other high-end wires. They show typical high-end cables/wires to propagate audio signals in the range of 50% - 70% the speed of light. The speed of light is the theoretical maximum speed an electrical signal can move through a wire if everything is perfect. Nordosts SPM Reference propagates signals at 95% of the speed of light. I cant say for sure if propagation speed affects sound quality of audio cables but Nordost isnt taking any chances with their top-of-the-line. $3,350 for an 8 foot pair, bi-wire or single wire. For review, Nordost sent 2 sets of 8 foot SPM Reference interconnect to permit shotgun bi-wiring or vertical bi-amping, a $6,700 speaker cable configuration. this is very expensive wire. Probably at the top reaches of anything that could remotely be considered "real world" prices. There are $15,000+ speaker cables and $5,000+ interconnects out there, but these exist as tour dforce products for very limited audiences. SPM is in the category below these cost-no-object products, very expensive but not outrageous in this context. Why so expensive? 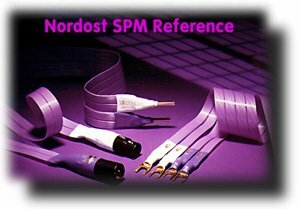 Nordost has been in the wire/cable design and manufacturing business for many years. These wires are not off-the-shelf products with colorful jackets and a high-end manufacturers name on them. These wires were designed from the ground up to be the best audio interconnect and speaker cable Nordost could make. The manufacturing process ties up expensive wire extrusion and Teflon extrusion equipment for a long time. For these wires to work as designed, they must be extruded very slowly with very high precision. Individual conductors must remain perfectly parallel when the Teflon insulation is extruded over them. While all of this is going on, that same equipment could have been producing 100s or 1000s of feet of less demanding wire and cable. The manufacturing process is so delicate, that a lot of what is made fails to pass quality checks and has to be scrapped. So you have a very slow manufacturing process using very expensive extrusion equipment and a high scrap rate. This is not the stuff of manufacturing engineers dreams. Im the last person to tell you to spend this kind of money on interconnects and speaker cables. Only you can decide if the performance of these wires in your system justifies the cost to you. If they are not within your budget limits, at least you can dream about them, just like car lovers dream of 12 cylinder Ferraris, Porsche Turbos and outrageous Callaway Corvettes. So you innocently cable up your system with SPM interconnect and speaker cable expecting some nice clean dynamic sound. What you get is something very different. You get to find out just how screwed up other wire is. My heart nearly broke. All those years listening to wires that sounded like that when I could have been listening to wires that sounded like this. If only someone had realized how screwed up audio wires were 20 years ago, wed all be 20 years of enjoyment richer today. The congestion, confusion, lack of balance and general lack of finesse of other wires was startling. Im not referring to $100 interconnects and $200 speaker cables either. Im talking about $500 - $1,000+ interconnects and speaker cables in the $1,000 - $2,000 price range from manufacturers with well known names, great reputations, and lots of glowing reviews. SPM Reference interconnects and speaker cables revealed these other wires as unacceptable, period. Ive never had anything quite like this happen during a review before  one product simply blows out everything else you have ever experienced before. The improvement is significant, easily audible. Anybody can and will hear exactly what I heard. There is no subtlety to it. You do not need "golden ears". You do not even need particularly good hearing to recognize the difference. It is totally and completely obvious. So how does SPM Reference sound? After 4 weeks, I would have said "like nothing." I really thought that soldering the CD player to the preamp, soldering the preamp to the amp and soldering the speakers to the amp would not sound any better than these interconnects and speaker cables. The open, easy, transparent sound made everything sound good. CDs that were less than stellar sonically were rendered without the ruthless edge that some reviewers seem to relish in their "best in class" wires. I have always been suspicious of the phrase "ruthlessly revealing" in high-end reviews because it always leads to dissatisfaction with CDs and LPs that should be enjoyable in spite of not having perfect sonics. Somehow, some way there had to be a way to get the ultimate in transparent musical sound quality without wrecking good music. SPM Reference reveals those "ruthlessly revealing" wires as being nothing but junk. Could the "ruthlessly revealing" wires have such bad "time smear" problems that they wreck all but the best sounding recordings? It wasnt only "ruthlessly revealing" wires that were beat-up on by SPM Reference. Other wires which definitely could not be called "ruthlessly revealing" still sounded lame in comparison to SPM Reference. by interconnects and speaker cables. I do not recall any electronic component upgrade getting me any more excited about the improvement in the sound of the system. You cant force a system to sound this good with expensive components either. The wires being used with expensive components will limit their performance no matter how many cubic dollars are sunk into the electronics.
" This is a most entertaining and enlightening experiment. Even if it is pretty unrealistic! invisible and unexpected. Then another box arrived from a different company. Suddenly the class of 1 became a class of 2. Number 2 is both more expensive and less expensive. Youll get to read about that in SoundStage! soon. Having reviewing experiences like the Nordost SPM Reference makes all the work worthwhile. There is no way to say for certain that SPM Reference would be the best cables for your system. There is the problem of how systems react to different wires. This can be unpredictable. What works well in one place, with one combination of components, fails somewhere else. But do know that Nordost SPM Reference is "out there" in a group with very few members. Compared to the small "elite" cable group, other wires, even other expensive wires, sound defective. You have to appreciate products like Nordost SPM Reference. While you may find the price out of reach, they bring a new level of performance into focus. Suddenly the old world record has been shattered and the bar has been reset to a higher position. Those of us who cant afford SPM Reference can look forward to the day when Nordost or somebody else figures out how to get this level of performance down to prices we can deal with. If youre lucky enough to have products that perform as well as SPM Reference within your budget, you can enjoy the performance now while the rest of us squirm nervously wondering how long well have to wait.